Because the Grow Bed is such an important part of our total Aquaponics System we need to put some careful thought into it’s design. Materials used, dimensions and location relative to the fish tank are all considerations. Listed below are some of the reasons why 300mm or deeper grow beds are good….very, very good and highly recommended to deliver excellent results in your Aquaponics System. Surface or dry zone. — # 1. The first 50mm is the light penetration and dry zone. Evaporation from the bed is minimised by the existence of a dry zone. Water waste minimisation is a very important principle in Aquaponics systems. Root zone. — # 2. 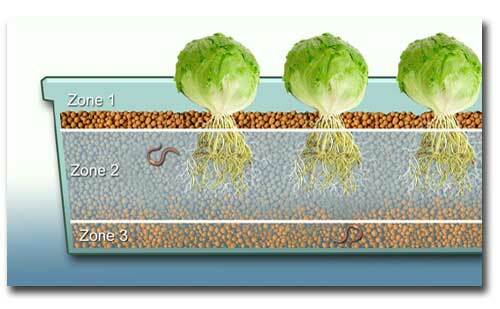 Most root growth and plant activity will occur in the next zone of approximately 150 – 200mm –in this zone, during the drain part of the flood and drain cycle, the water drains away completely, allowing for excellent and very efficient delivery of oxygen rich air to the roots, beneficial bacteria, soil microbes, and the resident earth/composting worms. Solid collection and Mineralisation Zone – # 3. The stored water provides a safety buffer in the event of power outage or pump failure… This stored water ensures that the plants will survive for very long periods without water flow.